Ian Abrahams' recently published Hawkwind biography - Sonic Assassins - traces the bands history from Dave Brock's passion for jazz and blues, busking in London in the 60's (at one time as a duo with Eric Clapton), to his developing interest experimental electronica, the formation and evolution of Hawkwind, and concluding with the current state of the band, which at the time of this writing is still waiting for a new album during the longest period since the previous release in the bands history. Abrahams begins the book with a focus on founding member Dave Brock, and does a good job of describing Brock's experiences in the emerging 60's British rock scene, which is always fun to read about. What's interesting is that though Brock was very much in that scene, we learn that he went a different route, traveling around Europe as a busking musician, an early indication of the less traditional and underground pathes that Hawkwind would be noted for throughout their history. The strength of the book is Abrahams' deft handling of Hawkwind's musical evolution, the convoluted parade of musicians that made their mark - some large, some insignificant - on the Hawkwind saga, and the choices, events and chances of fate that made them the encyclopedic definition of an "underground" band, their role as a "people's band" and proponents of free gigs. In tracking the bands musical development, Abrahams details the role of electronics in the music, and notes how, in contrast to Pink Floyd or Jimi Hendrix, that surveying the principal elements of the Germanic rock scene of the mid-60's gives a better clue to the components of the early time of Hawkwind. And we get a good feel for the bands move toward blending music, spoken word, dance, performance art and science fiction theater, the sci fi themed lyrics and poetry of Michael Moorcock and Robert Calvert being key ingredients in this regard. Abrahams takes us systematically through the years... each album, personnel changes, changes in the music. And on the journey one can't help but be amazed by the musical evolution. Early comparisons to German Krautrock á la Amon Düül later find the band occupying their own unique place in the punk realm, something that was less than apparent to everyone at the time. Abrahams notes how the dominance of punk and new wave in the late 70's were problematic for the band, and the journalists of NME, Melody Maker and Sounds were ready to discard Hawkwind as another aging rock dinosaur outfit, grouped with ELP, Genesis and Pink Floyd. This was ironic, because there were many prime movers in the punk arena that were ready and willing to acknowledge Hawkwind's collectivist approach and political ethics as a starting point in their own musical education. And to be sure, punk luminaries as large as Johnny Rotten and Jello Biafra have spoken to the role that Hawkwind played in their own musical discovery. In terms of the role of personnel in Hawkwind's history, throughout the book we get bits and pieces at appropriate points, and from varying mouths, as regards controlling personalities and "ownership" of Hawkwind. But Abrahams manages to fit all this within the objectively larger context of Hawkwind history and doesn't reduce it to soap opera, though this becomes increasing difficult as he approaches the present. But we do get a clear sense of the parade of lineup changes, with Dave Brock, and this is key, being the constant throughout. Abrahams keeps the reading enjoyable with fun little anecdotes, like Ginger Baker's coming and going from the band, a Johnny Rotten-Robert Calvert encounter, and an emotional Moorcock-Calvert tussle, but to his credit doesn't reduce his account of the saga to being a "tell-all" book. 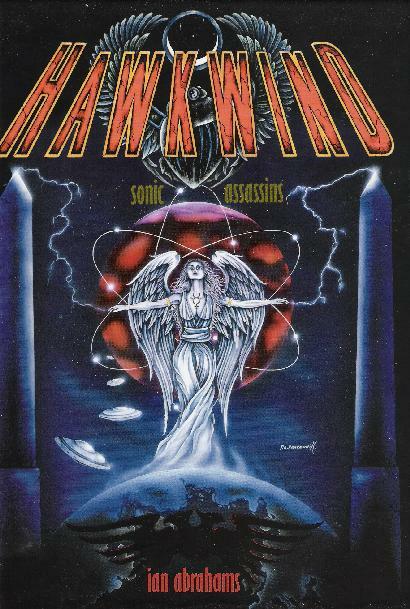 Abrahams also does a good job of detailing the critical transition of Hawkwind from an underground band in lifestyle and ethos, to a truly underground band reliant on independent companies for future releases (1982's Choose Your Masques was the last new studio album on a major label). Despite, and perhaps even thanks to it, Hawkwind continued to evolve, develop and morph, proving to be a creative force. And despite the continued coming and going of members, which can often seem like a blur, Abrahams points out that a core trio of Brock, Alan Davey and Richard Chadwick had been a force of stability in Hawkwind for many years. Quite an accomplishment given the bands history. Brock has taken the opportunities of his bank of contributors, gelled together the most unlikely of combinations and seen it work. That is the talent Brock possesses that has most to do with the longevity and constant renewal of Hawkwind. In himself, he is a unique rhythm guitarist, without the ability of a Langton. A competent keyboard player, but not at the same level as Simon House. As a singer, somebody who can certainly put across a song that needs a forceful delivery but not a classic rock voice. Lyrically, he is not in Robert Calvert's league. But as an arranger of talent, as somebody who can harness the geniuses of others, as a person who can bring together and fuse into his vision disparate parts, he probably has few rock 'n' roll equals. Finally, Abrahams points out that, quite sensibly, I'm not convinced that it would be possible for a band to exist in excess of thirty years without somebody being, in Brock's favourite expression, the 'captain of the ship'. I have to agree. Recommended reading to all Hawkwind fans, as well as anyone interested in the history of the rock music underground. Now maybe... just maybe... that new Hawkwind album will see the light of day in 2005. For more information you can visit the SAF Publishing web site: http://www.safpublishing.com.